A snow day means a play day! It’s a snow day! This week’s blog was gearing up to be something along the lines of responding to Conservative propaganda posted through my door about how teenagers need to be moved on, or it was going to be something to do with male playworkers and children at play, or it was going to be . . . but it’s a snow day! We have to write about snow if we’re writing about play. Here in the UK, or in my part of it at least, we don’t get a huge amount of snow. It’s always something special. Yes, I know some of you out there hate the stuff, but I can’t understand why. When it snows here, and especially the way it’s been snowing all day today, it’s a big deal. 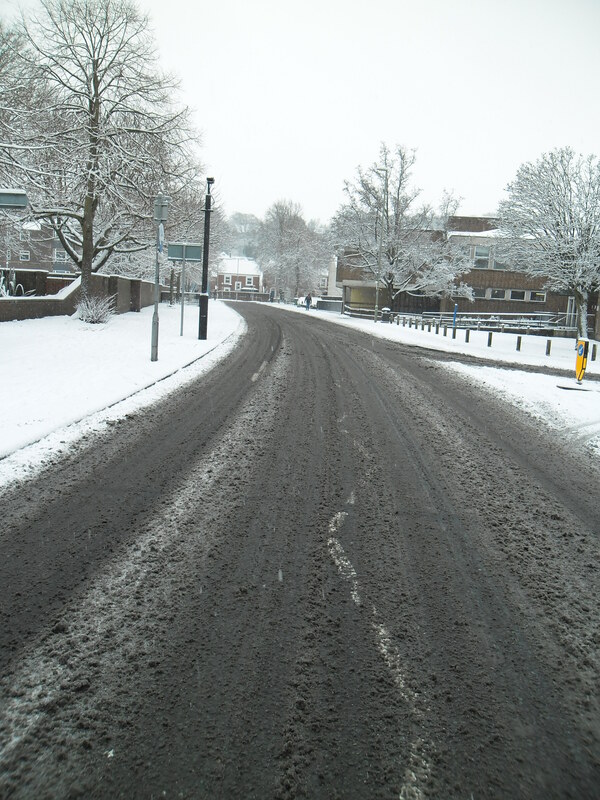 We’re really not very good in the UK when it comes to our infrastructure coping: our airports shut down, roads grind to a halt, schools shut down, etc. That, though, is all good for play. I had to go out in it. I went for a walk and was suddenly aware how quiet it was out there: very little traffic, no planes going overhead (I live on the flight path to a provincial airport); just the sound of crunching snow underfoot and the occasional sound of distant children. The sky was a deep milky grey. When it snows here, in this place, it reminds me of a city thrown back a few hundred years. I say that in a good sense. In the same way that snow blurs the physical boundaries of road and path, so too does it blur the boundaries between adult play/child play. It’s all white, it’s all snow on the ground; it’s all play on the hill. 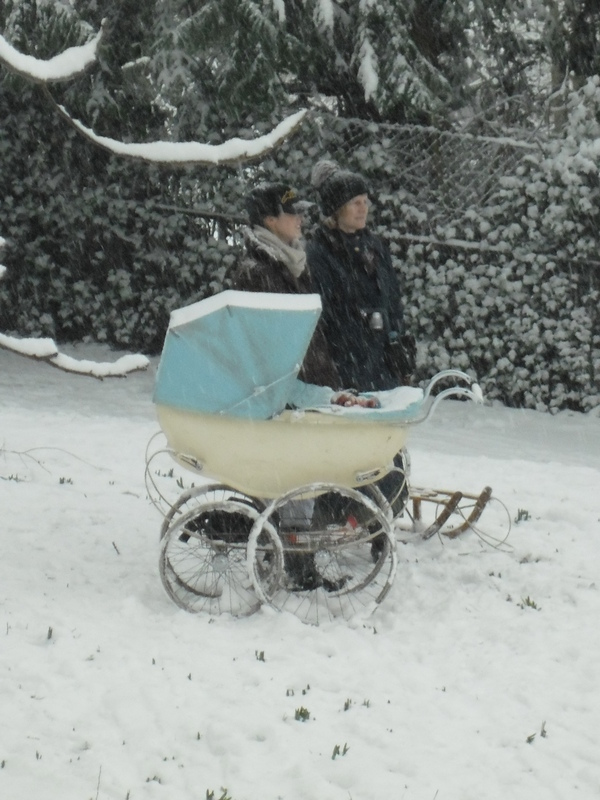 The first boy went on: ‘Do you remember that snow day we had and I was just crying . . .?’ I don’t quite know what to make of this, but I like to interpret it in the positive. When we go out in the snow, why do we go out in the snow? Only a few brave or not so forward thinking people go out in their cars. I don’t know why they bother to do this in this country. In Canada, or other places used to the wet cold fluffy stuff, they have chains for their tyres; they have four-wheel drives; they wear anoraks with duvets stitched inside them, and boots made of whole mooses or the like. We go out armed only with a small torch packed into our two-wheel drives, and a bloody-minded sort of blind hope that things will be OK. We end up sitting on the motorway, shivering, and wondering if we’ll ever get home. Yes, I’ve done this too. I saw a car fish-tailing around on a steep hill. The driver eventually got out and proclaimed to everyone around her that she was stuck, and how was she to get home? I told her that even with the ‘three or four strong men’ she was hoping to materialise out of thin air, they weren’t going to be able to push her up the hill. ‘Why don’t you turn around and leave the [two-wheel drive] car at the bottom of the hill, park up?’ I asked (helpfully, I thought). ‘But how will I get home?’ she said. Walking the thousand yards or so up the hill wasn’t, apparently, an option. A lot of us seem stuck in the 21st century. Sure, we appreciate our convenient lifestyles, but we forget that one weather event can change things for us. More of us, however, perhaps, have a deep set sense that ‘living the way we used to live’ feels good. Maybe it’s just me, but walking around not hearing the sound of cars or planes, and seeing empty streets, felt odd and calming in this hectic usual century we wade through. Back then, back when, back in the black and white days, when we had seasons and we knew what they were really for, there was something odd: there was a gap that we’ve filled now with the dreaded ‘health and safety’. I’m not the first or the last to commentate on this when it comes to snow. I was scanning the school closures list online at stupid o’clock this morning (I had a meeting at a school planned in). My school wasn’t closed (though I have a two-wheel drive car, so I cancelled anyway!) The school closures list is a litany of health and safety ‘covering ourselves’. Schools claim that their grounds are too icy or too dangerous or that approaches to the school are too hazardous. On my walk I saw upwards of a hundred children and adults playing in various places. 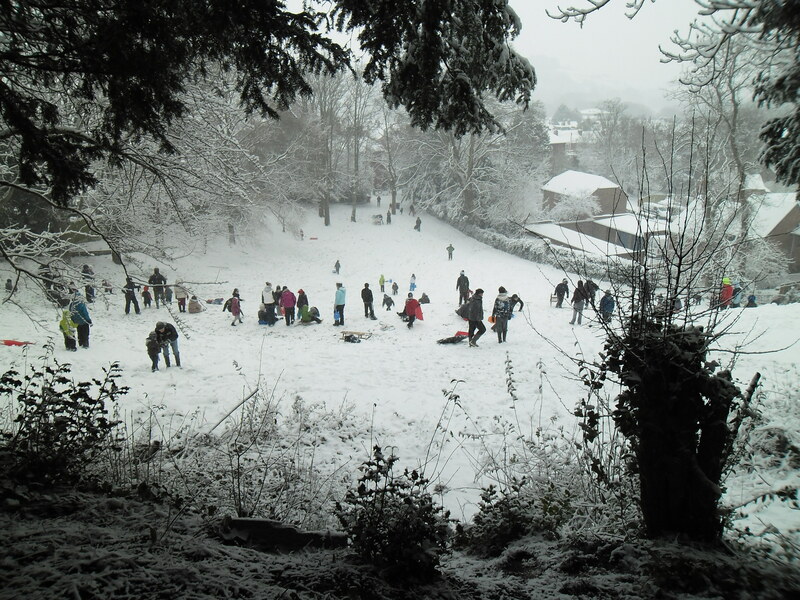 One child fell off a sledge, picked herself up again, and went back up the hill. That was it. You can draw your own conclusions. They’d been laughing around in the main pedestrian area, rolling snowballs, lobbing them over at some guy who’d come out of the shop opposite and who was lobbing them back. 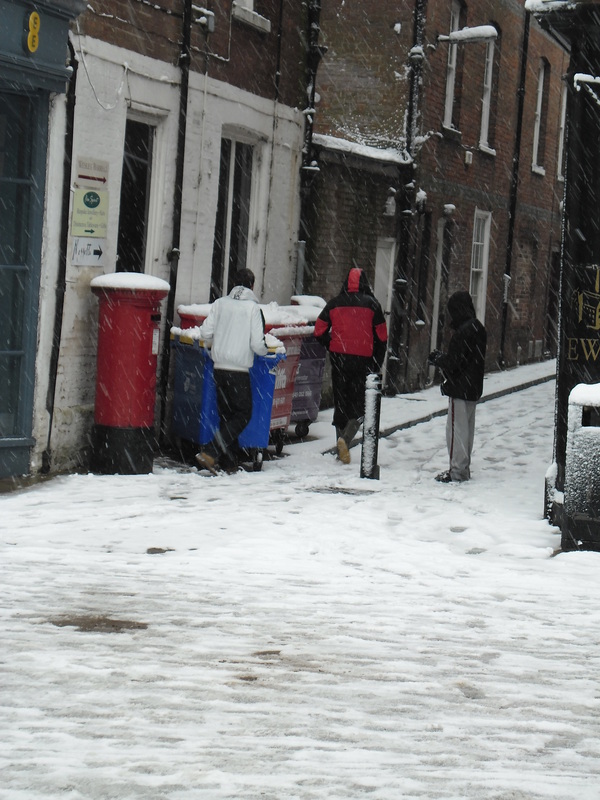 The snowballs were being thrown quite hard and over the tops of the heads of passers-by. The group then ran off, one with a huge snowball, to the alley fifty yards or so away. This got my attention, so I stayed to observe. Two of the group were at the far end with plastic snow shovels and they were ‘batting’ the snowballs aimed at them back. They threw some themselves, and the snowballs overshot the target sometimes and skidded across the High Street. Here’s the strange thing: not a single person stopped, complained, threw disparaging stares, seemed bothered at all. Ordinarily, I suspect, without snow, this group of lads would not have been tolerated for their play. So, I come full circle. This post was going to be something along the lines of responding to Conservative propaganda pushed through my door about how ‘anti-social behaviour’ needs to be addressed at our local shops, and how the teenagers need to be ‘encouraged to move on’: to do this the local councillors plan to install ‘triangular coping stones on top of the wall to make sitting there uncomfortable’. Right. Like that’s going to work! How about installing a snow machine? The group won’t necessarily move on, but at least there’ll be play, and maybe everyone can then just chill out and be just a little bit less ‘21st century wound up’ about things!